My lack of a criminal past owes more to cowardice than an abundance of virtue. I’ve always been uncomfortable with the prospect of rebellion, which made me an unlikely candidate for the task of getting expelled from the British Museum. The plan was hatched to explore unpalatable forms of touch, namely by nuzzling different artefacts until I unleashed an ancient curse/angered someone wearing a lanyard. For my quarry, I selected possibly the most famous space of any museum in the world: Room 4 (Egyptian Sculpture). If I was going to embark on a life of crime, this seemed like a fine place to start. What follows are my notes, scribbled as I dodged tourists and the wrath of Imhotep. For those with only an hour to spare, the British Museum provides a guide of nine objects all visitors should see. The Rosetta Stone is listed first. Their crowning glory makes an obvious target for devilry, but a knock on the thick glass confirms I’m getting nowhere near it. Obstacles: Constant crowd, glass case, monumental historical value. Devoid of any advanced “glass” security, the Sarcophagus of Merymose sits in the open, its only hurdle being the Please do not touch sign. As I scope out the joint, a tourist is photographed pretending to lick Merymose’s head. I conclude that touching the sarcophagus will make me literally no different from this buffoon. The noble, haunting face of Ramesses II is one of my most-loved pieces in the museum, but rests atop a plinth taller than me. While I could theoretically use the neighbouring “Statue of Roy” to aid my ascension, Roy presumably wouldn’t be pleased. Obstacles: Personal attachment, statue placed out of reach like a biscuit tin, Roy. The stela looks like a towering granite fishfinger and stands on a marble block standing on three random bits of wood, as if someone has been playing Jenga with inappropriate pieces. Surely a hearty thwack to the correct spot would topple it – with a lucky aim, I could definitely smush the sarcophagus lid of Padihorhepui, maybe even King Psamtek I’s screen slab. As I wonder whether I can file my copy from jail (do prisons have good wi-fi? ), I read the accompanying text. The stela was originally larger but two thirds of it were reused as building materials. It’s suffered enough. Obstacles: Ancient instance of recycling functioning as contemporary guilt trip. It certainly is a very large scarab. “This is one of the largest representations of scarab beetles to survive”, the caption agrees. Another eye-level piece, the statue depicts the god Khepri as a dung beetle, because sure, why not, and boasts a nearby guard. The conditions are perfect – with his fluorescent tabard the guard means business – so why can’t I strike? In my research it became clear that touching things in museums, even in the name of dubious scientific research, is foolhardy. Aside from the perils of handling old, fragile materials, when we touch objects our fingertips leave a residue of dirt, sweat, dead skin cells, and sebaceous oils that devastate over time. 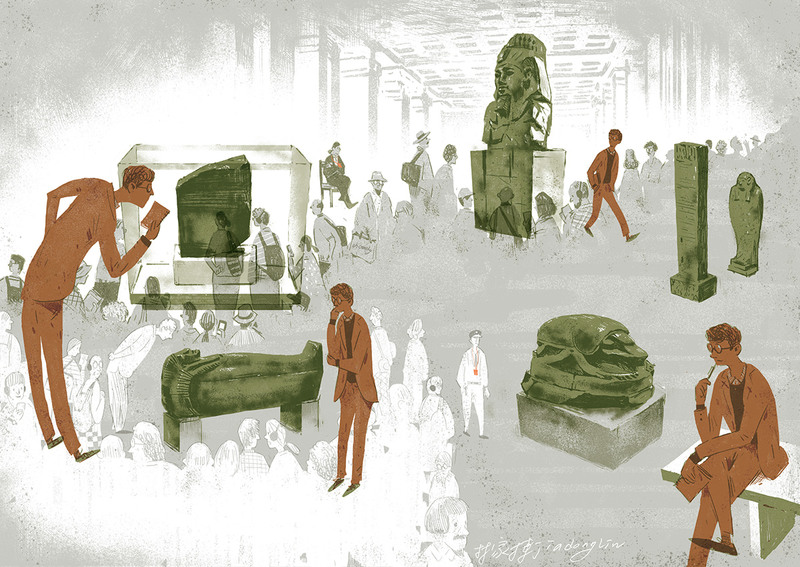 The British Museum receives seven million visitors’ worth of dead skin yearly. Infractions here are common but people pet the scarab like it’s an animal. They can’t help themselves. They see something amazing and reach out to touch it. I am reminded of my 8th birthday party when my mother spent hours making an elaborate swimming pool cake. The two-tone gelatine representation of water was so realistic that my friend Oliver felt compelled to poke it, prompting my exhausted mum to instinctively whomp the poor child on the head. Confronted with an ancient statue of an ancient god we are all transformed into children excitedly defiling a swimming pool-themed birthday cake. The action is understandable – we naturally use touch to gather information – but it’s worth at least a whomp. I retreat to a bench to watch the scarab. It looks beautiful, and I reflect that it has looked beautiful for over two thousand years. It looked beautiful in the temple of Atum in Heliopolis, it looked beautiful in Alexandria, it looked beautiful in Constantinople, and now it looks beautiful in Holborn on a damp Wednesday. If it’s cared for properly it has another few thousand years left in it. Long, long after you and I have disappeared, this absurd, miraculous scarab will be sitting in a museum somewhere, and it will still confound the heart. This is my favourite place in London, perhaps. I hope no-one kicks me out. Originally published in Oh Comely Issue Thirty-Seven. Illustration by Jia Dong Lin.